Another weekend, another section of the NDW. 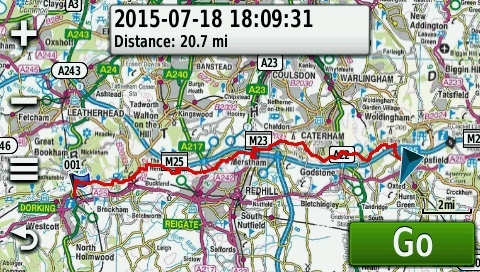 A train down to Dorking and a mile walk to pick up where we finished off last time where the NDW crosses the A24. First highlight: stepping stones across the River Mole. Classic chalk landscape reminiscent of last weekend on the Isle of Wight. A bit of industrial archaeology - an old lime kiln chimney. This folly is the Inglis Memorial was donated to the Borough of Reigate in 1909, by Lieutenant Colonel Sir Robert William Inglis VC. It was built as a drinking fountain for horses on the original main route over Reigate Hill. The interior has a lovely starscape zodiac painted on the underside of the roof. Reigate Fort (NT) and various outbuildings were built in 1898 as part of a 72-mile defence line to protect London whilst a huge ship-building programme was initiated by the British government. The fort held vital tools and ammunition to supply soldiers and artillery at short notice. Village cricket - it doesn't get more English than that. Lunch at The Feathers Hotel, Merstham. A healthy salad but only a half of Proper Job otherwise the afternoon stretch would have been a lot harder. A fair sized fungus; not sure what it is as I couldn't find it in our mushroom books but I wouldn't eat it unless an expert told me it was OK.
As seems to be the case on every stage start and end so far, we had a mile to walk to or from the station. 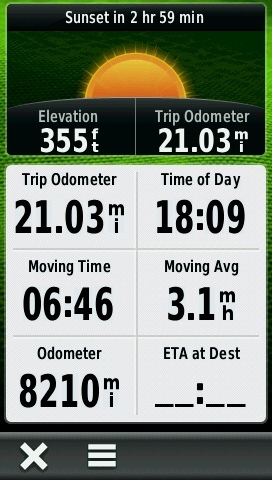 Including the extra mile from NDW to Oxted station the distance just nudged over the 21 miles. 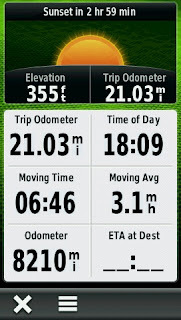 The route involved two motorway crossing (M25, M23) but bridges and overpasses paved the way with nothing more than the drowsy hum of traffic to disturb us. I just hope the Hadrian's Wall walk is as sunny and delightful in a couple of weeks time.